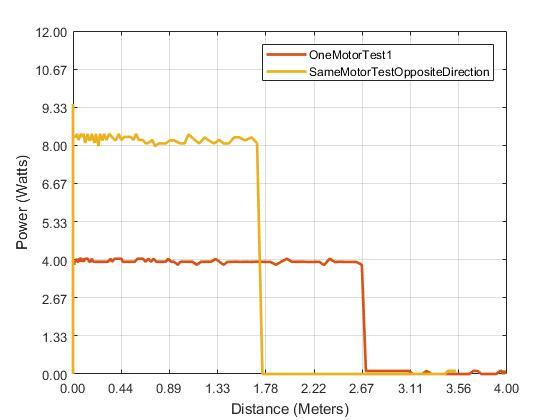 One Motor Test 1: Team AEV design was tested with one motor running in the opposite direction. 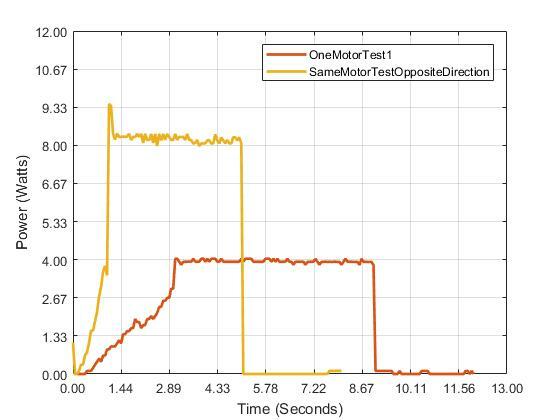 Same Motor Test Opposite Direction: Team AEV design was tested with two motors running in the opposite direction. 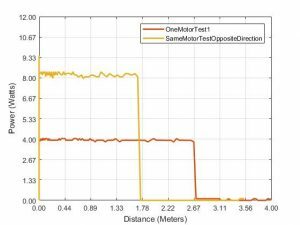 From these two tests, it was determined that the energy used to power one motor was considerably less than running two motors at a time. 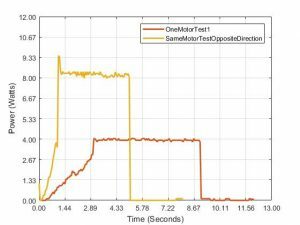 At 5.00 seconds, the test with two motors had used 34 Joules of total energy while the test with one motor had used 12 Joules of total energy. While it took one motor twice as long to reach the same distance, it only used 24 Joules of energy to do so. The team’s conclusion was that one motor was more energy efficient. We ran a small sample of secondary test running the AEV up the hill. To move the AEV up the hill with 2 motors, the motors each needed to run at 35% power. To move the AEV up the hill with 1 motor, the motor needed to run at 42% power. This meant the single motor ran more efficiently. Our design will include two motors that are positioned on opposite sides with only one motor running at a time.